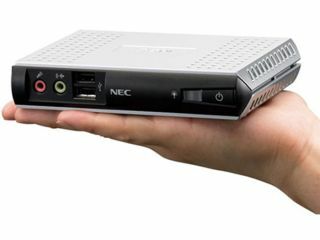 NEC's US110 thin client computer is light on weight and performance, but is all it needs to be. When we saw the breathless press release from NEC Japan boasting of its tiny desktop PC that weighs just 350g we almost got excited, but soon calmed down when it became clear the Japanese giant was just touting a simple, albeit very pleasant to behold, barebones business machine. The so-called 'thin-client' US110 is intended for companies that prefer to keep their data secure on a central server, allowing desktop PCs read-write access to it, but not to store it themselves. In fact, the only memory in the US110 is 128MB of RAM and 128MB of flash memory, which are all it needs to work with the server data. At ¥49,000 (£205), the new machine isn't exactly cheap, but NEC will be hoping space-starved Japanese firms will be drawn to its 150 x 94 x 30.4mm dimensions. It will also be assuming they're happy to reuse old keyboards, mice and monitors, as only the PC is supplied. As for the rest of the hardware, the US110 can output 1600 x 1200-pixels, has an Ethernet connection, five USB ports and no need for a fan, which means it could easily be tucked away out of sight.